Rectangular Flag Push Pins measure 5/8" x 1" with a 1 1/8" pin shaft. 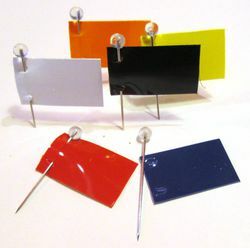 These rectangular flag push pins can be written on with a fine permanent ink pen to further identify locations. The rectangle flag map pins are packaged 25 to a box, and are available in six colors. Item Number Color / Quantity Price Qty.